The beautiful tiled fountain in this room was a gift to the Conservatory from Chicago’s sister city, Casablanca. 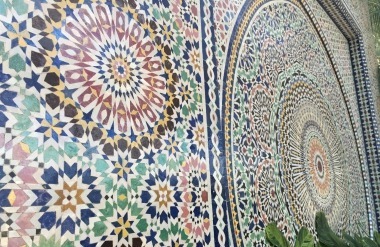 Each unique and colorful tile was cut on site and the intricate design and structure assembled here at the Conservatory. It stands now to remind us of the larger international community of which we are all part. In 1927, the Conservatory hit record numbers in visitorship with over 500,000 visiting in one year. At this point in history Horticulture Hall did not exist. The Conservatory was a simple loop of 6 display houses with the seventh fern room nestled in the middle. 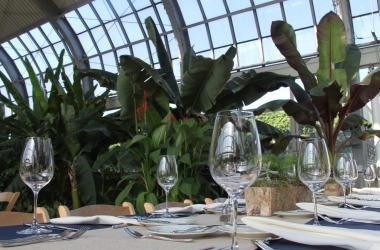 To accommodate such a large number of visitors, the Chicago Park District decided to expand the Conservatory to include a space where people could congregate which is now Horticulture Hall. Interested in renting the space? CLICK HERE to learn more. Looking past the Mosaic Fountain, visitors can catch a glimpse of another greenhouse. Though many think this is another part of our public space, this is a glimpse of what goes on behind the scenes at the Conservatory. 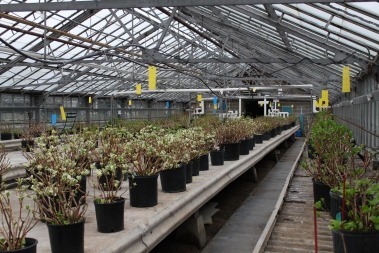 We have 9 propagation houses that act as nursery, hospital and laboratory, all in one. It is in these houses that staff prepare plants for display, nurse plants back to health and store plants for future shows.